Katie Cashin ’19 (left) and Dale Leonheart ’19 (right) acted as “Party Girl” and “Dead Bride” during the event. Content warning: this article references suicide. Residential Life staff transformed the vacant basement of Wilder Hall — widely rumored to be haunted — into an eerie haunted house on the night of Monday, Oct. 29. 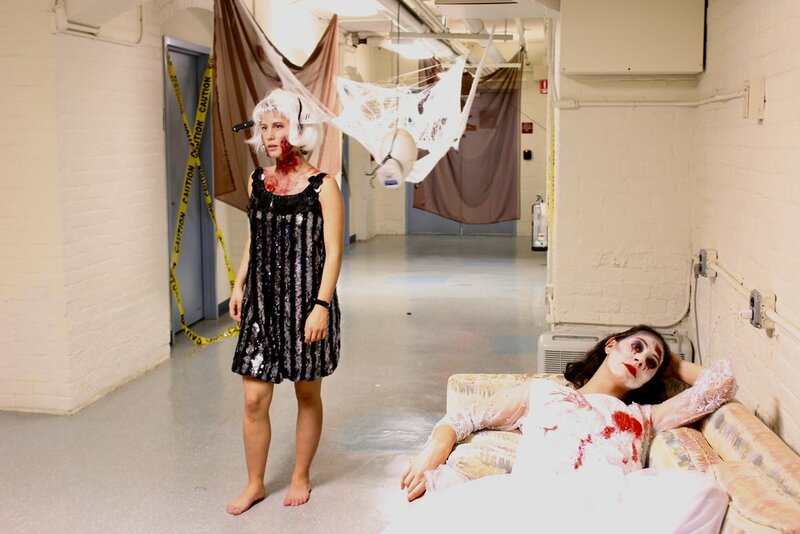 Wilder’s Fright Night welcomed Mount Holyoke students to tour the haunted space, followed by a “Fright Ball” on the building’s first floor. Wilder Hall is no stranger to spooky on-campus lore. Julia Cole ’19, the tour guide for the evening, began by telling one of the most famous on-campus legends, the story of the “The Woman in White,” better known as “the Wilder ghost.” While accounts of the tale vary, Cole, with a witch hat on her head, recalled the version which claims that an early 20th century Mount Holyoke student became consumed by grief when her husband, a previous Amherst College Student, was imprisoned and later killed during World War I. Immediately following the Laurel Parade, Cole said, the woman returned to her room and killed herself. She was later discovered by friends. Cole then claimed that the College has a portrait of the woman in the Wilder common room, but it is covered up by another painting and enclosed in a glass case. While there is another frame that sits behind the current picture on display, it is not clear if that image actually relates to the haunted legend. A key part of the story is also that the president of the College at the time was faced with a housing crisis and in order to prove the safety of the room so that students would live there, she spent a night in the dorm. Instead, she supposedly ordered the room to be boarded up and locked the following morning. The Alumnae Association has disproved many of the logistics of this ghost story in a blog post, noting that the room where the Wilder ghost supposedly lived and died was never actually used as a student’s room and that the portrait in the common room, although painted in 1890, was not actually given to the College until 1963. Although the truth behind the tale is still ambiguous, the story is one of the most famous within the Mount Holyoke community, and some 3rd and 4th floor residents still claim paranormal experiences. Whether or not people believe the legend of “The Woman in White” and her supposed continual hauntings, Monday’s event channeled the haunted history of the dorm to celebrate Halloween. Cole led the tour to the elevator where guests began their short descent into the basement. “This begins the self-guided portion of the tour,” Cole said as students funneled through the doors into the decorated space. Cobwebs transformed the hallway — which was previously used to house AccessAbility Services — into an ominous portal. Spiders fell on visitors and costumed students roamed the space in horror movie makeup. One student channeled the Wilder ghost herself; adorned in a blood-stained vintage wedding dress, she called to passers-by asking if they had seen her husband. When the brief tour wrapped up, it redirected students to the “Fright Ball,” where Wilder’s decorated TV room offered themed snacks and played classic Halloween tunes like “Monster Mash” and “Thriller.” In the dorm’s kitchen, students could play “blood pong,” with cups filled with a bright red punch. Zara emphasized how collaborative the planning of the event was, and said she worked with Facilities Management, Residential Life staff and other students who contributed their acting and makeup skills to make the event possible.